Do you want to get well and stay well? A homeopath who will travel to you. A homeopath with 23 years experience in practice, with over 1500 clients on his books. A homeopath who understands both conventional and complementary medicines. A homeopath who encourages you to make informed decisions about your healthcare choices without prejudice or judgement. Alastair specialises in "people" - young ones, old ones, weird ones, normal ones. With a BSc (Joint Hons.) degree in physiology and pharmacology from King's College, London, followed by a redirection into a more holistic approach to life based on what experience taught him, he is a homeopath (licentiate of The College of Homeopathy) who is knowledgeable and flexible in his practice, ensuring the focus is always on the client and their needs. He is insured by the Society of Homeopaths, certified as an Emergency First Aider, has CertEd. Stage 2 training and Enhanced DBS checked. With a vast client base, largely as a mobile homeopath or home-visiting homeopath, spanning London, Surrey, Hampshire and Kent over the last twenty years, he is well known in his field in the complementary health world, for his sense of humour as much as his homeopathic experience. His client base has more recently expanded internationally to include Skype and FaceTime consultations in North America, Europe and Asia. Outside of homeopathy, he has a passion for music and owns makeasound.net. 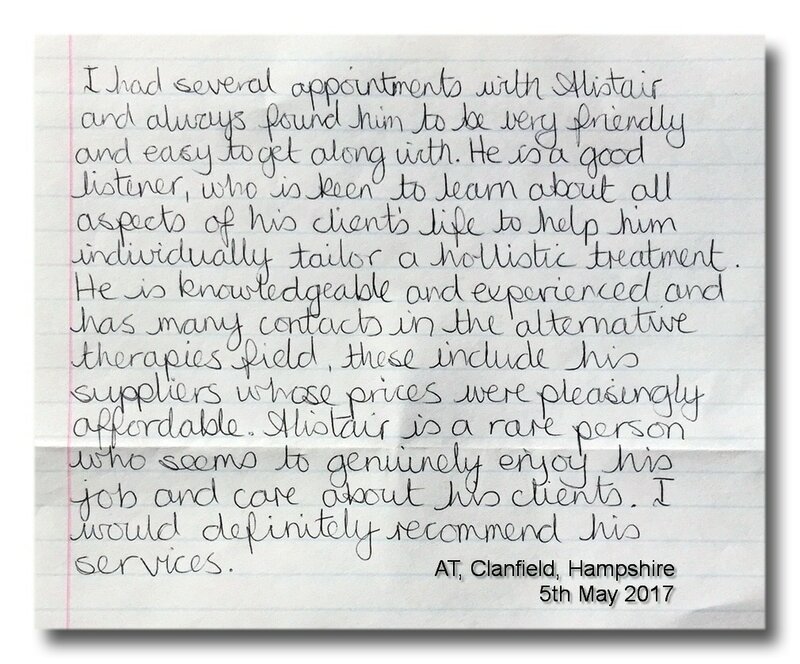 Feel free to email or call for a chat before deciding if he's the right homeopath for you. 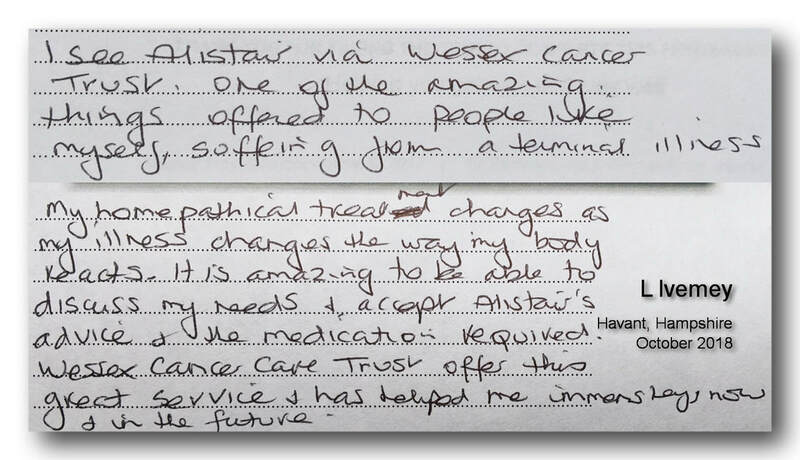 Testimonials shown are the personal opinions of Alastair's clients. I would like to make it clear that these statements are not meant to imply that a particular homeopathic medicine can cure a specific medical condition. This is not how I believe that homeopathy works. You may however note from these unedited comments that people who have been diagnosed with a wide range of medical conditions have reported that they have experienced an apparent benefit from homeopathy, from Alastair Hay, homeopathical.